In 1997, I was sent to Sinai, Egypt by the U.S. Army. I had been stationed the previous 3 years in the Old Guard in Washington, D.C. The Old Guard is the primary ceremonial unit for the Military District of Washington and the US Army as a whole. White House functions. The Tomb of the Unknowns. Arlington National Cemetery. The Old Guard performs all of these functions and more. After reading about the Multinational Force and Observers (MFO) in Army Magazine, I volunteered to go to Egypt by calling up my career manager in the Hoffman Building in Crystal City. He told me that I’d need a waver to leave The Old Guard signed by my Regimental Commander. I told him that wouldn’t be a problem. I had a pretty good relationship with my Chain of Command. As the HQ Platoon Sergeant for Alpha Company, I knew most of the key players in the Regiment at the time. About a year later, I was on my way to the Sinai. Back then, everyone heading to the Sinai had to inprocess through Fort Bragg, NC. I hated the place. Infantry Bureaucracy in it’s full glory. Serving in the Infantry in the US Army is a decent gig. I never thought to much of it. But Bragg takes everything to the next level. Bureaucracy. Stupidity. Everything. And the Bragg Airborne mentality is such that the Airborne Soldier is the greatest thing on the planet. Even the fat old ladies who guard the entrance to the commissary have attitudes. After a week, I made it out of Bragg without being court-martialed. Airborne shuffled my way over to the Airport in Fayetteville and I was off to Egypt. Via JFK in New York and Tel Aviv, Israel. After about 20 hours of flying and airport time, we arrived in Tel Aviv. it’s a different world. Israeli Soldiers and Civilian Police stalk the corridors of the Airport with Uzis and M16s in full view. Locked and Loaded and ready for action. These boys AND girls aren’t playing. I saw them tear through a couple of peoples baggage like it was nothing. they grabbed one Arab looking fellow and carted him off to some room for God knows what. No one is playing in Tel Aviv when it comes to security. Our MFO liaisson meets us at the baggage carousel. Some Staff Sergeant whose name now escapes me. he ushers us off into a 40 pax white bus with the MFO insignia on the side. If I remember correctly, we drive immediately for the border. Rafah gate. Right next to Gaza. I admit to being nervious. I had heard all of the stories of violence. Suicide bombers and such. We made it to the border without incident. We crossed out of Israel and into Egypt. My first 3rd World border crossing. In and out of your vehicles. Official Documents reviewed, stamped, reviewed again and stamped again. And a whole lot of waiting. On the Israel side, things were organized and clean. Crossing over into Egypt was like crossing over into the apocalypse. There were people camped out like refugees. Waiting to get out of Egypt and into Israel to carry goods to markets in Israel or further on into Jordan, Syria and beyond. There was trash strewn everywhere. Israel is green everywhere. Crossing over into Egypt, the green abruptly ends and in it’s place is desert sand and trash. As we drove off, one of the MFO vets yells; “LOOK! The Egyptian National bird!” and points forward to where a large black plastic bag flys across the front of the bus. We all got a good chuckle out of that. The other thing that you immediately notice is the flies. They are out in droves. Flies in Egypt are a constant nuisance. Not like in America or elsewhere. You cross the border into Egypt and immediately you are surrounded by swarms of flies. Cross back over into Israel and they disappear. Perhaps, the plagues of Moses continues. We get through the border and arrive at North Camp about 3 hours later. The whole process has taken about ten hours from airport to North Camp. We’re inprocessed. Assigned rooms. Given our work assignments. And then told to rest the next day. At that months Hail and Farewell, we are all greeted and introduced around. After about two weeks, we start to venture out. My first foray into the Egyptian country side was Port Said. Rob Pando, Peters and I take a weekend trip to a shopping mall and on to Port Said. The strangest thing to happen was when Noon Prayers are called. We are all standing on a street corner. People buzzing all about. Merchants. Folks out to purchase wares at the market. Kids begging us for a couple of Egyptian pounds. Suddenly, the muezzin starts the call to prayer. Instantly the streets empty. The place is a ghost town. No people anywhere. I had no idea what was going on. Three of us start walking down the street. We look down one of the main streets and we see them. There must be hundreds. Possibly thousands. In the middle of the street. Prayers rugs out. Bent over praying towards Mekkah. I wish I had taken a picture. I was too new and was fearful of giving offense. I had never seen anything like it. The whole town seemd to be praying towards Mekkah. As fast as it started it finished and suddenly the streets were swarming again the mass of humanity that lives and works in Port Said. Later, when we all became comfortable, we would visit Cairo many times. We would also learn about the lures and beauty of Israel and especially Tel Aviv. I favored Tel Aviv over Cairo. There are bars and discos and beaches and women. Tel Aviv is similar to European cities. With enough of a mix of Americana to make it seem more at home for me. My second trip to Tel Aviv, I met a gal (Galit Kabra) there and fell madly in love in a relationship that had no future. But it was fun. 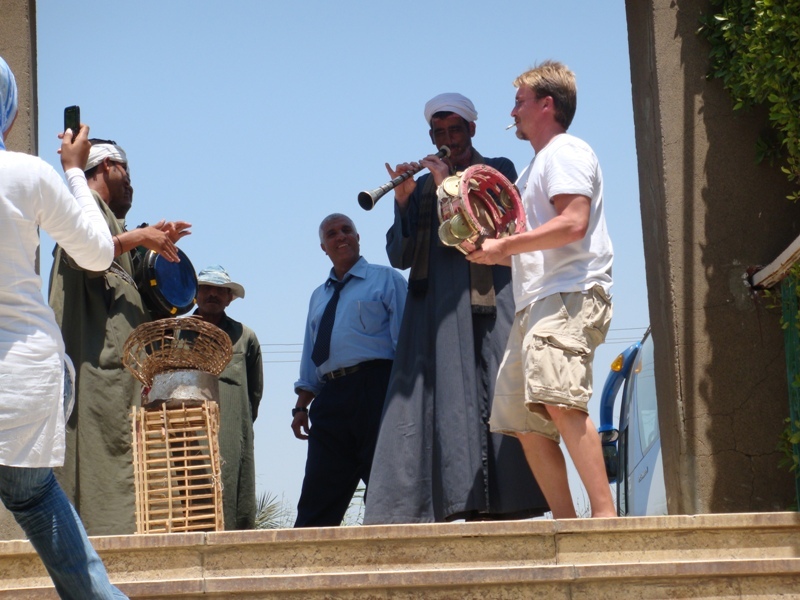 In our trips to Cairo, we explored the city, the Pyramids, the river and everything else. I watched the guards at the Tomb of the Unknowns and Sadats memorial change guard once. I saw the reviewing stand at which Sadat was assassinated. Rob Pando and I visited Sakkara and viewed the October War Panorama (Propaganda). I made a couple of good friends in the Sinai that year. I had a series of outstanding experiences and visited some extraordinary places. Petra and Jerusalem among other places. 1998 was a good year for me. All of the pictures below were taken from 1997 to 1998. I had an automatic 35mm film job that I got from my ex-wife. I think it was a hand me down from her parents. It took some decent pictures. It’s been ten years since I last visited the Giza Plateau. Much has changed. Ten years ago, you could walk up to the Pyramids and actually climb them. I’m not sure if that was a good thing or not. But it’s much better than the Disneyland like setting that surrounds them now. It’s funny. I don’t remember the roads. I don’t remember the buses. I looked at my old pictures and at least one road was there. I can see one bus in one of the pics as well. The last time that I was in Cairo. Back in 1998. Perhaps, I was there at a less busy time. I didn’t remember the roads and such around the Pyramids. There were a few other tourists during that visit. Not many, though. I rode a camel out of the desert to the Pyramids. We came upon them from the rear. Cairo looked far away. It gave the illusion of being out in the desert and away from civilization. I rode the camel to the smaller pyramids. Dismounted my camel and walked up to the three great Pyramids. On impulse, I started climbing. There were a couple of Bedouin and one or two tourist police hanging around. I got about 2/3rds of the way to the top of the Great Pyramid. One of the tourist police started pointing his AK47 at me and yelling for me to get down. I ignored him and continued to climb. Nearly to the top. It is not possible now to climb the Pyramids. 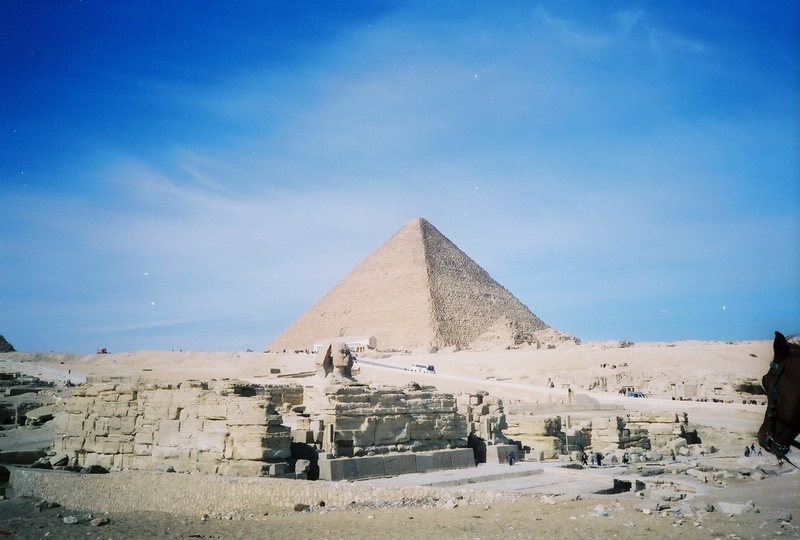 The Egyptian tourism authority has laid more asphalt roads around the pyramids. Buses actually drive up to the base of the Pyramids and offload hundreds of Japanese and European tourists each day. Possibly thousands. There were so many the day we were there, it was impossible to get a clear picture of the Pyramids without a Japanese or Euro tourist in the photo. There are hundreds of vendors trying to sell scarves, cheap jewelry, small statues and all manner of trinkets. You also have to contend with the Bedouins and their camels. The primary push is camel rides, of course. If they can’t get you to ride the camel, they attempt to have you sit on the camel for a picture. If they can’t get you to sit on the camel, they try to bully you into giving them money for taking a picture of them or their camel. I just laughed at them and sang “La La La” to them. La is No in Arabic. I walked up to the Cheops Pyramid and started taking pictures of everything. Including a little guy with a camel. I walked up and snapped a few photos of his camel. The little dude asked me for a cigarette. So I gave him one. I kept taking pics of him and his camel and everything in the area. After a few minutes, an older Bedouin fellow walked up and demanded that I get on the camel for a pic. I said “LA!” He then told me to give him my camera so that he could take a pic of me with the camel. Again, I said “LA!” I would also say ; “Nah, I’m cool dawg.” He started saying “Doog! Doog?” I laughed. I like to throw American slang at these folks. It throws them off. Perplexes them. They usually don’t know what to say to it. Finally, he demanded that I give him money. “Baksheesh!” I laughed again and said “Hell no…” as I walked away laughing and singing “La La LA.” i do a lot of singing when I’m on vacation. I don’t know why. I guess because I’m so happy to be out there and free. These guys try to bully or harass tourists into giving them money. Sometimes it works. You’ve got these small Japanese women walking around looking lost. Euros walking around looking bewildered. It was quite comical. The Pyramids and Sphinx are now surrounded by asphalt roads. Tourist police in the hundreds walking about. Riding camels and horses. The tourist police try to get you to give them money as well. Sometimes, they just see you walking by and ask you to take their picture. If you do, they ask for “baksheesh.” Arabic for money, I think. Walking around Cairo, invariably you’ll have little kids running up to you whispering “Baksheesh.” They put on these sad faces for you. I’ve seen a group of kids laughing and playing. Suddenly, one of them will spot a tourist and he will assume the saddest posture and look imaginable and walk up to you saying baksheesh in a low voice as if he is sad and hungry. This was similar to the kids begging in India. 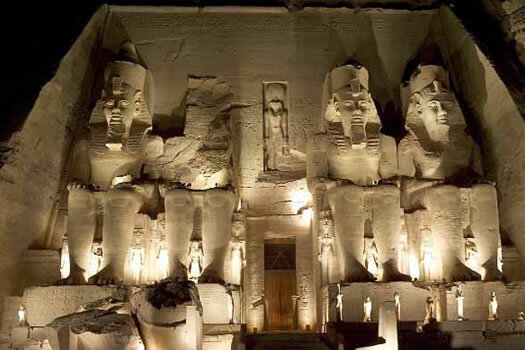 The Pyramids and the Sphinx are still magnificent. Don’t get the wrong idea. The asphalt does make them more accessible. Unfortunately, the roads and buses and massive crowds detract from the beauty and mystery of these ancient monuments. It was still immensely enjoyable visiting Giza and gazing upon the Sphinx and it’s sister monuments. And, of course, this time we had Shaimaa telling us wonderful stories and histories which made this visit all the more enjoyable. Limestone cap. Originally, the top was capped with a gold Pyramid. On the way back to Cairo from Saqqara, we stopped for lunch at a local restaurant. When you enter, a group of musicians playing local instruments play music. I assume to announce your entrance. Becca, Shaimaa and I sat and ate. Of course, I finished eating first. I walked to the front to have a smoke. 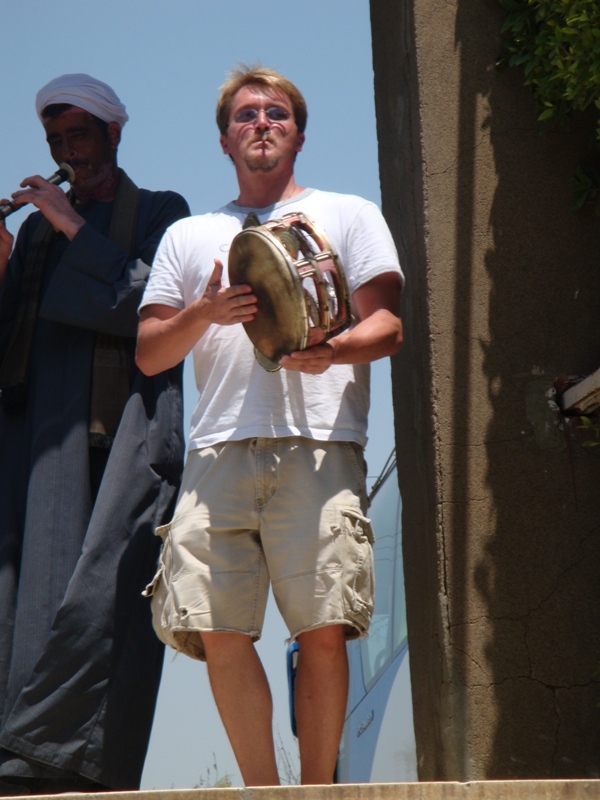 When I came near to the musicians, an Egyptian guy called me over. I walked up and they started showing me their instruments and asking me if I could play. I didn’t even attempt the horn. One of them handed me the drum/tambourine combo and they started playing. So I went along with them and started cutting up with them a bit. Hey! I played drums from 6th to 9th grade. I can still play a bit after all of these years. lol it was a fun time. While I was jamming with my sadikkis, Shaimaa was recording me. And apparently, laughing herself silly. All in good fun. All in good fun. Later on. 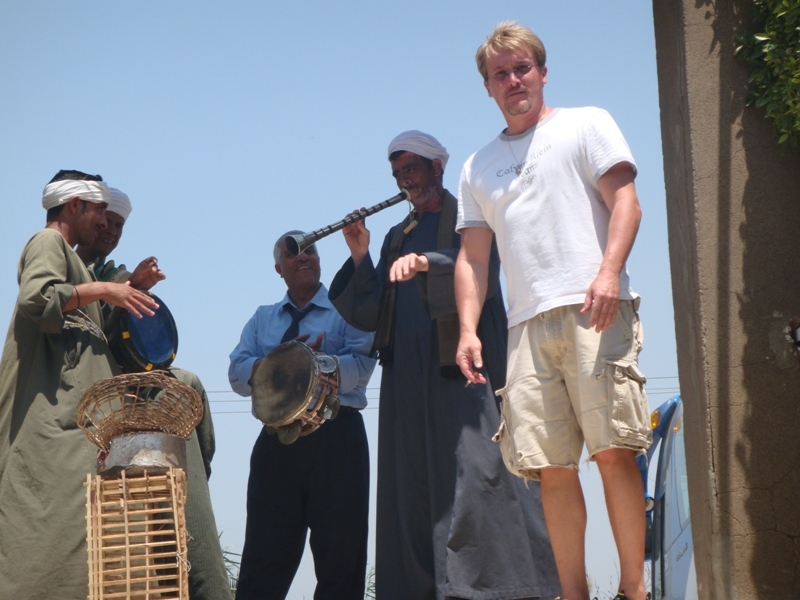 Down in Luxor, we jammed out to some Celine Dion on the way back from Karnak. Apparently, our driver was a big fan of Celine. He played that song 3 times in 20 minutes or less. Either that or all Celine Dion songs really do sound the same. 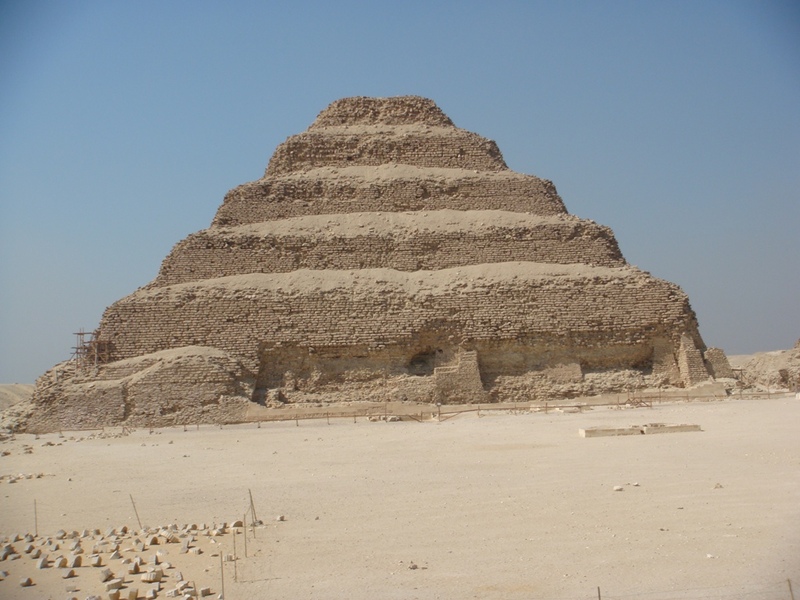 This is the Pyramid of Zoser at Saqqara.